This last week has provided me a stark reminder of how volatile October weather can be in some places. Much of Central America, for example, has been fairly inundated by endless rain. That information doesn’t usually impact a New Yorker like me, but since I just got back from Costa Rica I found the inclement conditions highly relevant. So when I ask each week what you’re doing during the coming weekend, feel free to explain that your weekend will likely be ruined by the coming blizzard/monsoon/tsunami. Weather isn’t a boring topic when it’s extreme! So what are you doing this weekend and will you be birding? Share your plans in the comments below. After eking out as many avian species as possible during my short, wet trip last week, I’m taking this weekend off! Corey, on the other hand, will be doing enough for the both of us. Among the many highlights of his coming weekend, the Focus on Diversity: Changing the Face of American Birding Conference features prominently. Corey will be joining a multitude of bird educators from the Northeast/Mid-Atlantic Region to discuss effective outreach to promote birding to more diverse audiences. Along the way, look for Corey at hotspots in Cape May and John Heinz NWR. 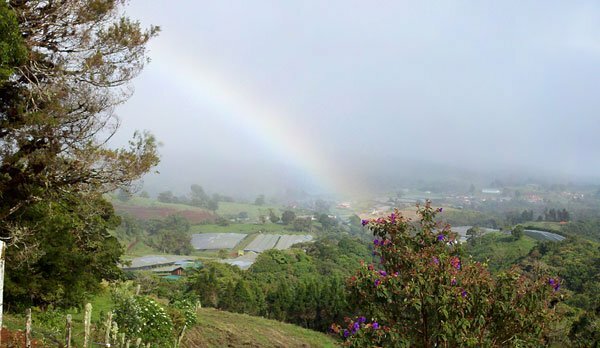 When the clouds break in the Costa Rican highlands, look for rainbows! I have a special birding experience lined up this long weekend. But I’m not going to tell you what it is. If I can escape the Central Valley, I will be looking for Sungrebes, Snowy Cotingas, and migrants in Tortuguero National Park, Costa Rica. Somehow all this Costa Rica talk is making my duck watching in Michigan seem rather…lame.